All entry-level vehicles are their bread and butter models. These do the maximum numbers even for luxury car manufacturers. Hence, these models are crucial for the company as they can change the entire balance sheet for the company. One such vehicle is here in question, and it is the BMW X1. The X1 has been clocking 300-400 units monthly for BMW and the company has titivated the current generation giving it a mid-life facelift. We share our thoughts on the upgrades that BMW has given to the BMW X1. The changes on the X1 are subtle and prominent too. The front grille and the headlamp design have been revised and even the fog lamps have been remoulded. The hood also looks more belligerent than before, and the new alloys contribute to the glam. The altered front bumper now houses a large matte black finish lower end that adds to the rugged-appeal. The corona-rings in the headlamp and ORVMs have also been changed. The silhouette more or less remains untouched. At the rear, the tail lamps and the bumper have also received some mild changes. 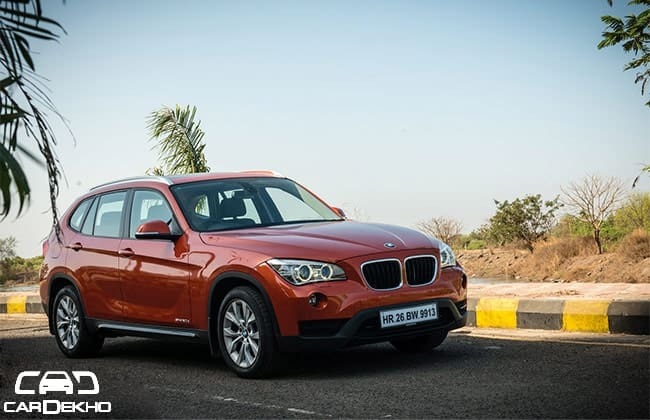 The BMW X1 refreshed model also comes in a orange shade, which makes it look sporty. The exterior has received some minor changes, and even the interiors get certain upgrades here and there. The quality is similar on the inside, but now the X1 comes in three trims— regular, sport and luxury. The luxury has a bit of beige and sober styling while the Sport gets some vibrant and trendy colour ambience. Both cater to different set of audience and BMW has got that bang on. The space in the front row is fine, and the large and supportive seats ensure a tireless drive even on long journeys. The rear seats however lack the space for tall knees, while the head room is good. The central tunnel in the second row means only two people can sit in comfort. The boot is also luggage enough for weekend touring. The X1 no longer gets the petrol mill, and now it has only the 2.0-litre diesel engine, which was the volume seller for this compact SUV. BMW India has played it smart by retain only the volume seller engine, however we are confident that the company will reintroduce the petrol engine, with a higher power output at a latter stage. The 2.0-litre oil burner produces 184 brake horsepower and 380Nm of peak torque. The engine is noisy with a loud diesel clatter, at least on the outside. Inside cabin has been insulated well to avoid any kind of sound that will bother the occupants. The power delivery is smooth and undeviating, and there is no feel of the vehicle lacking the required power anytime. Drive it in the city or on the highway, and you will not feel the urge to even shift to the sport mode for quicker overtaking, the comfort mode does the job most of the times. The X1 also gets the eight-speed self-shifting transmission. This makes it easier to drive, as the torque band has an even better spread. The shifts are smooth, however the response time has some lack. The eight-speed box has definitely improved the performance and the fuel efficiency of the X1. BMW’s have been the ultimate driving machine and the X1 has no difference. It is one of the best handling compact SUVs around. You can drift into a corner with ease and make it tail happy too. When you intend to shave of seconds, the X1 does that too. X1 now has electric steering wheel that makes it lighter and easier to drive. The steering feedback isn’t compromised either and it’s a boon to drive in the city. The ride is a still on the stiffer side, thanks to the run flat tyres and the short moment of the springs. But the ride suppleness is enhanced when you compare to the previous X1. It doesn’t break your back when you drive on rough roads, and hence it is another major positive in BMW’s favour. The BMW X1 is definitely a good compact SUV to consider if you need an absolutely fun car to drive. If you wish to sit behind and want your driver to take you to places, then we recommend you either upgrade to the X3 or buy an SUV with a lesser premium badge. The X1 is a great driver’s car, and at the rear it is the less knee room that will not make you so comfortable, until to push the front seat forward. As a product, we like the BMW X1 and even the improvements on it are subtle and were required.